Higgs Boson announcement from CERN: why the god particle is so important. The discovery of the Higgs boson particle puts our understanding of nature on a new firm footing. A model of the Large Hadron Collider tunnel in the CERN visitors’ center. Who would have believed it? Every now and then theoretical speculation anticipates experimental observation in physics. It doesn’t happen often, in spite of the romantic notion of theorists sitting in their rooms alone at night thinking great thoughts. Nature usually surprises us. But today, two separate experiments at the Large Hadron Collider of the European Center for Nuclear Research (CERN) in Geneva reported convincing evidence for the long sought-after “Higgs” particle, first proposed to exist almost 50 years ago and at the heart of the “standard model” of elementary particle physics—the theoretical formalism that describes three of the four known forces in nature, and which to date agrees with every experimental observation done to date. The LHC is the most complex (and largest) machine that humans have ever built, requiring thousands of physicists from dozens of countries, working full time for a decade to build and operate. And even with 26 kilometers of tunnel, accelerating two streams of protons in opposite directions at more than 99.9999 percent the speed of light and smashing them together in spectacular collisions billions of times each second, producing hundreds of particles in each collision; two detectors the size of office buildings to measure the particles; and a bank of more than 3,000 computers analyzing the events in real time in order to search for something interesting, the Higgs particle itself never directly appears. Like the proverbial Cheshire cat, the Higgs instead leaves only a smile, by which I mean it decays into other particles that can be directly observed. After a lot of work and computer time, one can follow all the observed particles backward and determine the mass and other properties of the invisible Higgs candidates. I say candidates, because so far each of the two major LHC experimental collaborations has claimed to discover a new particle with properties consistent with the other, and consistent with the general predictions of the standard model, which suggests that the Higgs particle should be produced at a rate comparable to the rate observed and should decay into the specific combinations of known elementary particles that are observed. They are being very conservative. One can in fact quantify the likelihood that the observations are mistaken and that the events are actually background noise mimicking a real signal. Each experiment quotes a likelihood of very close to “5 sigma,” meaning the likelihood that the events were produced by chance is less than one in 3.5 million. Yet in spite of this, the only claim that has been made so far is that the new particle is real and “Higgs-like.” The existing data set is still too small to statistically determine with precise accuracy that the data is consistent with the standard model. This cautious approach is actually a good thing, because it leaves open the possibility that the particle being observed is not exactly the simple Higgs particle of the standard model. Instead, it may point the way toward understanding whatever new physics underlies the standard model—and perhaps explain outstanding mysteries from the question of why the universe is made of matter and not antimatter, to whether our universe is unique. The idea of the Higgs particle was proposed nearly 50 years ago. (Incidentally, it has never been called the “God particle” by the physics community. That moniker has been picked up by the media, and I hope it goes away.) It was discussed almost as a curiosity, to get around some inconsistencies between predictions and theory at the time in particle physics, that if an otherwise invisible background field exists permeating empty space throughout the universe, then elementary particles can interact with this field. Even if they initially have no mass, they will encounter resistance to their motion through their interactions with this field, and they will slow down. They will then act like they have mass. It is like trying to push your car off the road if it has run out of gas. You and a friend can roll it along as long as it is on the road, but once it goes off and the wheels encounter mud, you and a whole gang of friends who may have been sitting in the back seat cannot get it moving. The car acts heavier. Within a few years, it had been recognized that this phenomenon could not only explain why elementary particles like the particles that make up our bodies have the masses they do, but it could also illuminate why two of the four known forces in nature, electromagnetism and the so-called “weak” force (responsible for the processes that power the sun), which on the surface appear very different at the scales we measure, are actually at a fundamental scale merely different manifestations of a single force, now called the “electro-weak” force. All of the predictions based on these ideas have turned out to be in accord with experiment. But there was one major thing missing: What about the invisible field? How could we tell if it really exists? It turns out that in particle physics, for every field in nature, like the electromagnetic field, there must exist an elementary particle that can be produced if one has sufficient energy to create it. So, the background field, known as a Higgs field, must be associated with a Higgs particle. In the 1990s in the United States, a gigantic machine called the Superconducting Super Collider was being built (involving the largest tunnel ever dug—some 60 miles in circumference) to search for the Higgs—and the origin of mass. But Congress, in its infinite wisdom (Congress seems to have gotten no wiser since), decided that the country couldn’t afford the $5 billion to $10 billion that had already been approved by three different presidents. Back then, $5 billion was a lot of money! 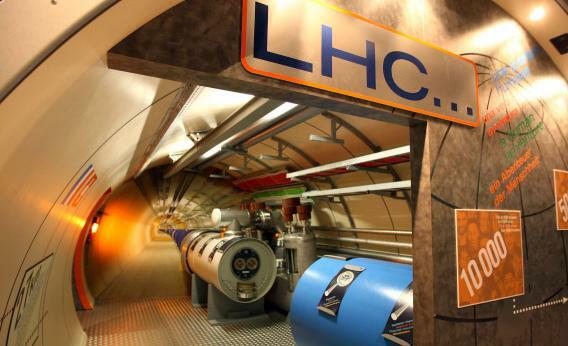 So, the LHC was constructed in Geneva by a group of European countries, and the rest is history, or will be. The discovery announced today in Geneva represents a quantum leap (literally) in our understanding of nature at its fundamental scale, and the culmination of a half-century of dedicated work by tens of thousands of scientists using technology that has been invented for the task, and it should be celebrated on these accounts alone. But I find it particularly exciting for two reasons—one scientific, the other more personal. First, the standard model, as remarkably successful as it has been, leaves open more questions than it answers. What causes the Higgs field to exist throughout space today? Are there other forces that dynamically determine its configuration? Why doesn’t the same phenomenon that causes the Higgs particle to exist at the mass it does cause gravity and the other forces in nature to behave similarly? Over the past 40 years or so, a host of theoretical speculations have been developed to answer these questions. But like those who are sensorially deprived, we may just be hallucinating. The cold water of experiment may now wash away many of our wrong ideas and, perhaps more importantly, could point us in the right direction. In the process I expect what we will discover about the universe may currently be beyond our wildest dreams. More than this, however, the Higgs field implies that otherwise seemingly empty space is much richer and weirder than we could have imagined even a century ago, and in fact that we cannot understand our own existence without understanding “emptiness” better. Readers of mine will know that as a physicist, I have been particularly interested in “nothing” in all of its forms and its relation to something—namely us. The discovery of the Higgs says that “nothing” is getting ever more interesting.